June 16, 2017, 10:54 a.m.
New research by YouGov Omnibus in conjunction with Cancer Research UK indicates that over half of UK adults walk less than a mile each day. The data shows that 52% are only walking up to or less than a mile a day during the week, which is the equivalent of just 2,000 steps. The findings indicate that some are walking even less than that. Almost a fifth (17%) walk less than a quarter of a mile, which is a small total of 500 steps. Almost a third (32%) said that lack of time was a main reason stopping them from walking more, a quarter (25%) said bad weather and nearly one in ten (8%) said they didn’t feel safe walking on their own. Our data shows that 25-34 year old’s are walking the most, on average almost two miles per day. Those over 55 walk the least - approximately a mile and a half on average. YouGov CharityIndex data points to a campaign that is resonating with the public. The charity’s Buzz score (whether or not you have heard something about the charity in the past two weeks) has risen from +10 to +15, a considerable jump from the start of the month to now. Our tracking data also shows that Cancer Research’s Ad Awareness score (whether or not you have seen an advert for the charity in the past two weeks) has gone up since the start of the ‘Walk All Over Cancer’ campaign, rising from +21 to +25 in the same time period. 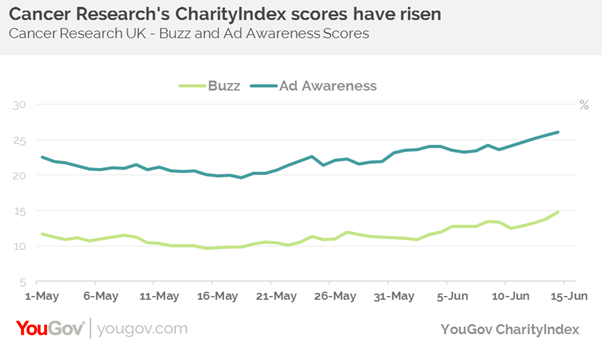 What’s more, the charity’s overall Index score (an average of its Impression, Value, Satisfaction, Buzz, Reputation, Recommend and Quality scores) has jumped 7 points from an already positive score of +41 to +48, from the start of May to early June. Cancer Research has always sat consistently near the top of YouGov’s CharityIndex rankings, and it can be content that this particular campaign, notwithstanding many of the other fundraising drives it is undertaking at present, has impacted on public perception of the organisation in a positive way.